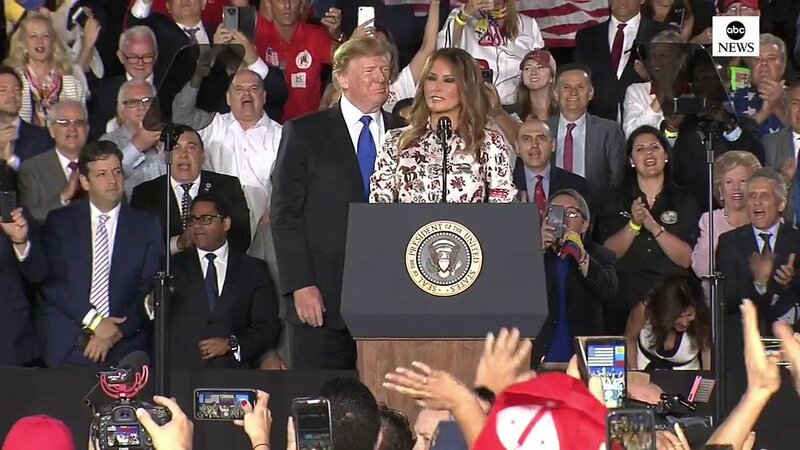 World News Tonight's tweet - "NEW: President Trump and first lady Melania Trump deliver remarks to the Venezuelan American community in Miami, Florida amid unrest in Venezuela. "In Venezuela the people are on the brink of reclaiming their own liberty," the first lady says "
Her voice is like nails on a chalkboard. I am Venezuelan living in USA for 3 yrs now with my two kids. I love this country and I just wanted to thank you for such amazing speech. Thank you for your support. We never expected and you have no idea how my heart is still crying tears of joy. God Bless your Family. The First Lady has been very consistent: the best way to reclaim liberty is to marry a rich businessman in an arrangement of convenience. Thank you for the beautiful speech, First Lady. The sound of freedom. Awesome first lady making a great effort to fulfill her roll & supporting her husband. I love that couple. They are the envy of many. Keep it up my lady!!!! 👍🏻 I admire people who overcome their fears & limitations. Your english is getting awesome. You must be proud of yourself. Welcome to Miami. Loved your speech, and your husband’s. Thank you FLOTUS for your incredible leadership and remarks made today in Miami! We are with you!!! ❤❤❤ God bless and stay strong!! Maybe they should go to the Detention Centers at the border and talk to the Venezuelan people detained there. Beautiful to see you both together standing up for a very principled cause that the world shares your view tyranny has no place forever again in our world. The most beautiful First Lady in the history of our country. Kind, compassionate & sincere. We are blessed ! He should offer to send AOC to Venezuela to straighten out their country.
. El Fin de Maduro El Destino de un Hombre es su Carácter Y los Sueños, Sueños son Sueños Monstruos de la Razón En su Bunker, Maduro parece un Hitler Están en una Piscina de Oro Con Cilia, la peliPintada Los Indios mambean Coca en un Poporo Pa hacer su Viaje hacia la Nada . Beautiful inside and out our first lady should be on every cover of every magazine, on every magazine rack in America! This is what CLASS looks like! Melania: "now please see your friendly ICE agent on the way out of the building tonight. Papers out please". Happy President's Day to the best FLOTUS and POTUS ever! Freedom never felt so good! Thank you both so very much! Preening behind the wife. What do either one of them know about Venezuela? President Trump, I've been reading the comments left by the Venezuelan people on youtube. I don't know that I've ever seen so many thank you and prayers for you or any one in my life. They very much appreciate what you are doing for them. thank you for your sacrifice for our freedom.may god bless you and your family. "In Venezuela the people are on the brink of reclaiming their own liberty,"
Trump 2020......Term Limits must be Mandatory....this way we can help stop these corrupt Politicians in Washington ! What a wonderful First Lady! Mucha gente en Venezuela, víctima de la ignorancia, habría preferido a escuchar a Hillary o a Barack. En ese escenario, el discurso se hubiese centrado en el estrechamiento de relaciones con las teorías. Miento. No se hubiese dado ningún discurso. Sure. Set them up to be killed. Oh please. They cant even unite Americans. What makes these 2 grifters think they can unite Venezuela? I would love the First Lady to review The Eager to Play, perhaps this short tale is a perfect gift to the children she meets so often. You were wonderful ❤️ thank you for your service to our great country! Where’s the compassion for the kids locked up in detention centers due to the autocratic, non democratic policies of your husband? He’s becoming a Maduro clone. USA!! USA!!! Amazing FIRST COUPLE!! The greatest couple we have had in Our House, leading Our Country and showing class as POTUS and FLOTUS TRUMP!!! President Trump and our beautiful First Lady Melania speaking for the people of Venezuela is the best..
Visit and pose, visit and pose, visit and pose. #bebest@nothing. People of Venezuela, Donald is playing you all like a fiddle for political advantage. Remember that. Thank you Melania Trump. This February 23 will be decisive. Pray God for us ... Victory is near ... We will be free !!!!! It will be good to get both of these two out of WH. Very good speaker, @FLOTUS. Love it! Please speak to us more often. She sounds like a second rate Bond villain!! "as your First Clady".......America you have turned yourselves into a laughing stock!! Did he tell them he’s building the wall and making it harder for Venezuelans to come to America. Melania, thank you for your kind words towards Venezuela and Venezuelans. You have a very kind heart. God bless you and your family.